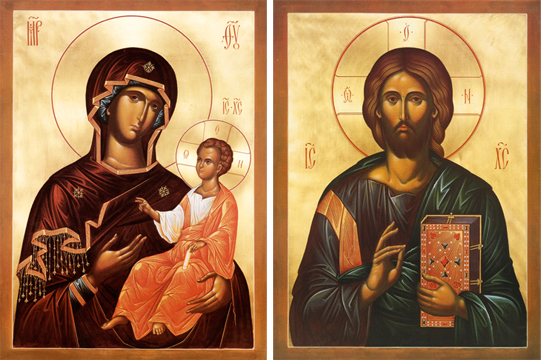 Here is the fifth Matched Set of icons of Christ and His Holy Mother. These icons were painted in 1992 by Fr. Andrei, a priestmonk at Holy Trinity Monastery at Jordanville, New York. They are made in the egg tempera technique and although Russian in style, incorporate some elements of the Byzantine style at the same time. They were painted for and reside in the chapel at the monastery dedicated to the Optina Elders. In icons of Christ, the letters IC and XC usually appear in the upper corners or near the shoulders of His figure, and have a small mark above the letters that indicate that they are a contraction. The letters IC represent the Greek word for Jesus, and XC the Greek word for Christ. In icons of the Virgin are the Greek letters representing Mother and Of God, although they do not exactly correspond to English equivalents. In the cross in Christ’s halo or nimbus are the Greek letters which spell, “I AM”, what God told Moses to tell Pharaoh when asked who sent him, the Existing One before all ages. Jesus showed his identity with this same God when saying to the Jews, “Before Abraham was, I am” for which they took up stones to stone Him for blasphemy, not knowing the time of their visitation.